PARIS --- Testimony by two senior Pentagon officials on the status of the F-35 program is so contradictory that they could be describing two different programs. 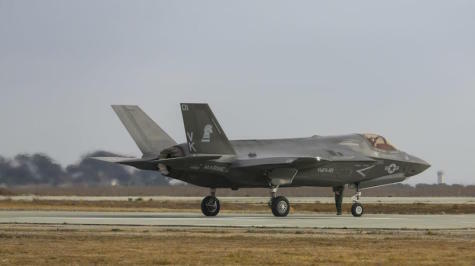 For example, the F-35C test airframe “restarted testing in mid-February but stopped three days later when strain gauges indicated cracking in a titanium bulkhead; it is expected to restart in May,” adding further delays. The Fully Mission Capable rate for the F-35 fleet “has declined steadily since December 2014. Data from February 2016, the latest month available, show a fleet-wide FMC rate of 30 percent and an F-35B FMC rate of less than 14 percent. It is also important to understand that the program’s metric goals are modest,” Gilmore said. The software bugs do not affect all three F-35 variants, making their correction more problematic. Appearing before the U.S. Senate Armed Services seapower committee April 20, Deputy Commandant of the Marine Corps for Aviation Lt. Gen. Jon Davis told lawmakers that his service’s F-35Bs are not affected by a software bug that causes the APG-81 radar to shut down in flight. In other words, the latest software version that was uploaded to fix pre-existing problems in the F-35A and F-35C introduced new problems, which then affected other systems and subsystems in a sort of domino effect. “The software stability problem primarily affects the radar, Commander of Naval Air Forces Command (NAVAIR) Vice Adm. Paul Grosklags said at the [same]hearing, but because the F-35 is so integrated the glitch’s affect spans beyond the radar,” USNI News reported April 25. “We’re seeing system resets, system anomalies much more often than we could accept,” Grosklags said. All in all, Gilmore predicted that these problems mean that the program’s Initial Operational Test and Evaluation (IOT&E), now scheduled for 2017, is very unlikely to begin until 2018, or possibly even 2019. The full details of Gilmore’s 38-page written testimony depict a program that continues to stumble on new problems as it repairs previous ones. The testimony is available here, and its main points were summarized by Flightglobal in an April 26 story. The contrast could not be greater between Gilmore’s evaluation and the far rosier views expressed by the Joint Program Office director and his superior, Pentagon acquisition chief Frank Kendall. This did not surprise Committee Chairman Sen. John McCain, who said that the F-35 program has "been a scandal and the cost overruns have been disgraceful….and it's a textbook example of why this Committee has placed such a high priority on reforming the broken defense acquisition system," the Associated Press (AP) reported from the hearing. Kendall and Air Force Lt. Gen. Christopher Bogdan, the F-35 program manager, told the hearing they are "making solid progress" with the F-35 and are confident of overcoming the challenges,” according the same AP report, with Kendall adding that "The F-35 is no longer a program that keeps me up at night." However, the Joint Program Office’s far more optimistic view of the program is not substantiated by any metric or objective measure. “The software bugs that have plagued the F-35 program for months are largely resolved and no longer pose a threat to the Air Force’s goal of declaring its jets operational this year, according to the program chief,” Defense News reported April 26. This is however not consistent with the schedule for the operational evaluation. Replying to a question, Bogdan told McCain during the hearing that about 2,600 people work in the Joint Program Office, which costs about $70 million a year to operate. "The information that I have is it's nearly 3,000 (people), and the cost is $300 million a year," Associated Press reported, adding that McCain replied "But $70 million a year to run an office is ... pretty disturbing." Click here for the written testimony as well as a video of the April 26 hearing (2:13 hours), on the website of the Senate Armed Services Committee.